We just found out Google Presentation is out! The Google Docs is now completed! With the introduction of Google Presentation, now you can collaborate a presentation online. This has been a missing piece of Google office suite. They even change the name from Google Docs and Spreadsheet into Google Docs. 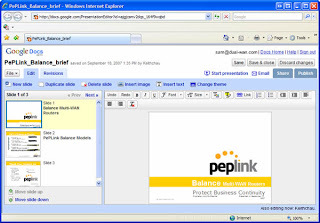 Multiple collaborator can edit the same presentation at the same time. The software is just amazing since it uses a highly compatible CSS so you can view it in all browsers. You can also upload images and changes backgrounds using the theme selector. When you can done with the presentation, you can also choose to save it as a ZIP package for offline archive. We find this following example from our friends at PePLink. We are able to do a IM base webminar within minutes. This is not currently available using Microsoft PowerPoint unless with extra software or web application. Collaborator can also take part leading the presentation at anytime by the press of a button. For example, a marketer can introduce a market overview of a product while a sales can take control of the webminar and lead the part on pricing structure. I am just too excited and i have cannot help but to share this with you. This will definitely overshadow the Zimbra bought by Yahoo yesterday and will haunt Microsoft Office unless they provide a simple webminar option. Here is what Walter Mossberg, the famed WSJ tech writer, wrote on Open Source Software in his latest article reviewing the Ubuntu Linux. Open source is a two-edged sword. While it draws on smart developers from many places, nobody is ultimately responsible for the quality of the product, and open-source developers often have an imperfect feel for how average people use software. While his review focus on Ubuntu, but i guess the above quote is very general and applies to all open source software. If you don't have the time, experience and tolerance of failure for an open source alternative, a commercial product is always the better choice. With his comment backing me, I am confident to recommend a real multi-wan router over open source software for all business use. Which is better, a Multi-WAN Router or an open source router software? Multi-Wan router works because it has specialized software inside the device. As open source software is getting more popular every day, people started making open source router software. Some of these OS Router Softwares has Multi-WAN features. For example, pfsense, Vyatta, and ClarkConnect. It’s open source and it’s free. But is this the right solution for you? Here I try to illustrate the pros and cons of using open source router software to achieve multi-wan. While open source router software can be free (as in beer), there are lots of hidden costs. Open source software isn’t exactly free if you are using it in a business commercial setting. A licensing fee may be required. In addition to that, you will need a PC to run the software. While you can use the extra computer lying around your storage room, a new dedicated computer is needed for full performance and reliability, let alone the computer geek who can understand those Unix/Linux commands. A Multi-Wan router, as Sam pointed out in his recent article, can cost as low as $300. The expensive ones, on the other hand, can cost you up to $10,000 or even more. The price range is very wide actually, so there should be a perfect router for anyone. But we always recommend a medium-priced multi-wan router. The cheap ones are plagued with problem, and the expensive ones are, well, just too expensive. Multi-WAN Router can take less than an hour to setup. All you need to do is plug it into your network. However, it may take days or even weeks to get OS router software running properly. This is some serious labor hour in that. Subsequent modification and update are usually easier with multi-wan routers. If you want a hassle free setup, go for the Multi-WAN. While all multi-wan routers is essentially a computer, but they are optimized for maximum reliability. OS router software installed on a regular computer, if not properly configured, will be more likely to crash and freeze. A dedicated device of multi-wan router will provide maximum reliability. Isn’t that what you wanted when you consider a multi-wan solution? Vyatta, and ClarkConnect require a paid support. And this support fee is not cheap. You can buy a reliable multi-wan router with that price. Moreover, since most multi-wan router companies provide email support for the first year, the price of using support on open source software is actually higher than buying a multi-wan router that comes with support. Commercial multi-wan router provides firmware update for free or for a price. For example, PePLink released a firmware a few months ago that cost money. But this paid upgrade contains new useful features such as smtp forwarding, DNS priority. Patches and betas are released regularly for new feature and bug fix. OS Router Software are also actively developing new feature. However, the quality of such software is subject to the community contribution. There are successful open source software like Mozilla Firefox that contains little bugs, make possible by a large active community that supports it. The open source support community varies a lot and the quality of the software varies with it. On the other hand, commercial firmwares have a QC team testing the firmware upon each release ensuring it meets highest quality requirement. If you are using the open source router software in an existing computer at home, and using community support exclusively, you can be using this multi-wan computer for free. Be prepared to invest a lot of your own time in tweaking such software. But if you are using it in office, or planning to get prompt support, why not consider a real multi-wan router? A great “feature” of open source software is that you can edit the code of the software and therefore making it accommodate your need. This customization is not easy but can great benefit your special need. An active community will support the open source software and therefore make important suggestion, comments, and monitor the software performance. This community will allow the software progress actively. But as i points out earlier, the variation of this community, for example, number of users and participation of user, can affect the software's quality. With a OS router software installed on your BSD distribution. You can also install other server services such as Apache, or Asterisk. Notice that this only work for causal use. Having multiple server service on the same computer can cause serious outrage, and when that happens, your multi-wan setup will fail. I hope this article can provide an objective review of the multi-wan routers and open source router software. Feel free to comment and express your opinion. Why a $300 router doesn't work? It's not difficult to find a cheap dual WAN router out there. They cost anything from $250. The question is, do they work? *And*, if so, how good? If you are running a home network, chances are you don't care too much about its stability, quality, performance and such. Even so, a cheap router may not even work well at home! Just a rebrand/OEM product - Some vendors just took a no-name brand from somewhere and mark their name on it. Be smart, ask them if they own the underlying technology. Just one product out of 100s or even 1000s - For popular consumer brands like Linksys, DLink, a dual wan router is just one small member of their entire product line. You bet, we can imagine how much attention they pay to these home routers. Did I mention support? - OK, seriously, would anyone expect good support at this price level? Did I mention they crash a lot? - Simply poorly designed software. Still the old saying - You get what you paid for! If it's for home, well, that's fine. It doesn't hurt much. Now if you're running a *business*, I think you should be careful. Get a truly business grade multi wan router instead. It's an one-off investment, so it will pay off over time nicely and quickly.